The break before the new year is an excellent opportunity to have some fun “playing” in the lab, which makes it an even better time to start EDAX’s first blog. 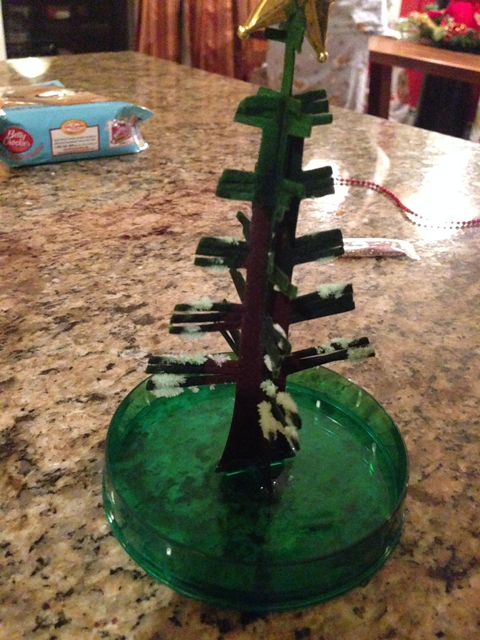 A few days into the holiday break, my 10 year old daughter and I opened up a ‘grow your own Christmas tree’ package that we bought at the dollar store. 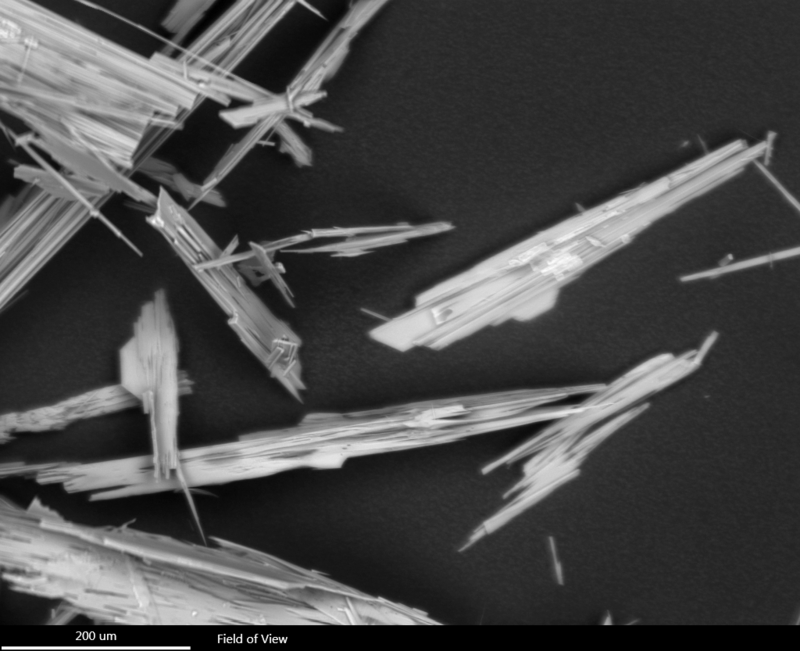 I didn’t realize it at the time, but I was about to conduct a grade school level science experiment, except this time, with access to my scanning electron microscope and x-ray system. Out of my usual chemistry inquisitiveness I looked for an ingredients list. I was disappointed not to see what it contained so that I could anticipate what was to happen when we started mixing. We placed the cardboard tree in the stand and added the special fluid packet. Within a few minutes we noticed the capillary action drawing the fluid up through the tree, but that didn’t really keep our interest so we went about doing something else. A few minutes later, we were amazed to suddenly see that our tree had in fact sprouted crystals. My daughter described it well, if not scientifically, when she said that it looks like mold. I, however, took a closer look, and you can too. After a few more minutes we lost interest altogether until the next morning when I stopped in my tracks upon seeing the full grown tree. My next thought was, “I wonder what this is” and I recalled a joke from an old friend, Bob, who often said that ‘we have ways to figure that out’. During the week I was off, I used my best guesses to decide what it may be. My original thought on the chemistry was Magnesium Sulfate, but then I also got to thinking about the microstructure of the crystals. A quick google search had me rethinking my first idea since the structure didn’t line up. So finally I got to pack my ziplock bag and bring my sample in to work. 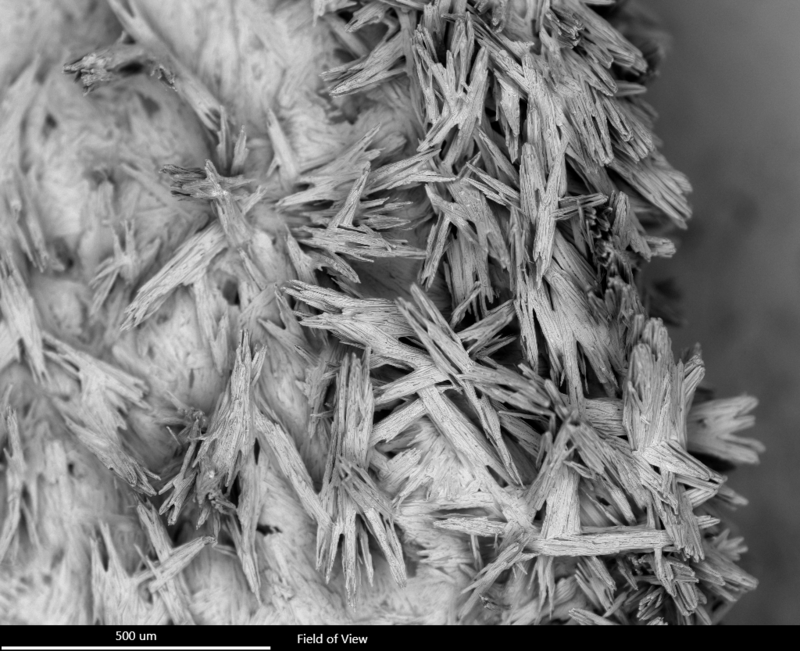 The first SEM images I gathered were just beautiful to me. A grown crystal is perfection and this was a classic example. The tragedy was in the delicacy and it was hard to find an area that contained long repeating and unbroken crystals. 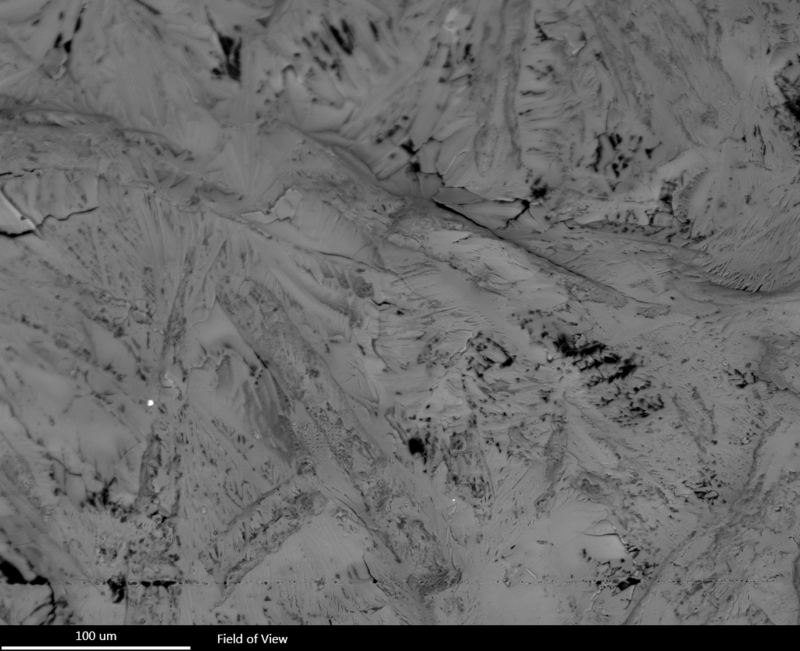 The images show dense areas of crystals and also areas looser on the carbon tape. A quick 10 second spectrum showed these to be a Potassium and Phosphorus containing compound, possibly monopotassium phosphate. Of course, NaCl is seemingly in everything so I poked around and discovered that there are areas of crystals within the crystals and those are the NaCl rich areas. Since my speculation was that the special fluid pouch was salt water, I decided to get a second ‘grow your own tree’ to test the cardboard before adding the fluid. This is when the real fun started. I opened the new package and put a sample of the cardboard on a stub. It’s always a nice reminder to look at paper and remember that it was once living, when you see the cellular features. 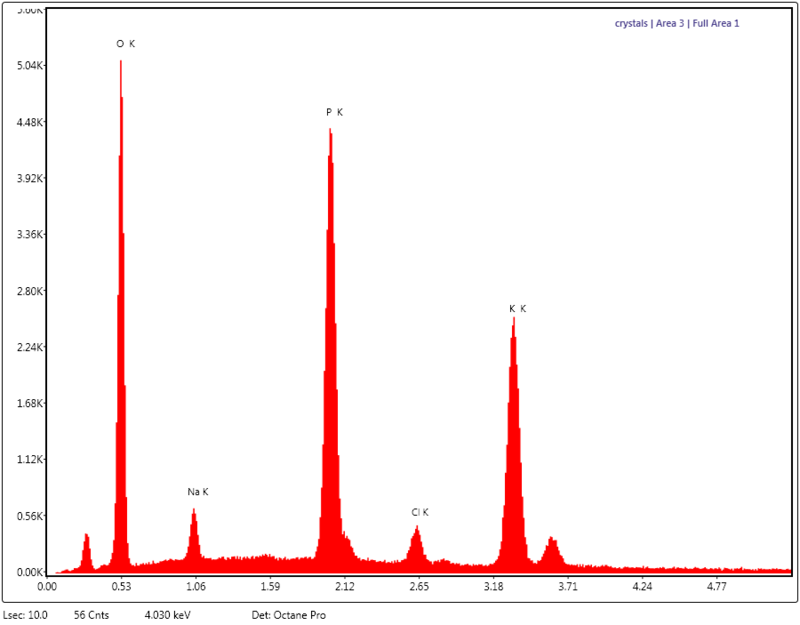 But the chemistry was not very interesting, except for a few NaCl crystals – so where was the Potassium and Phosphorous coming from? 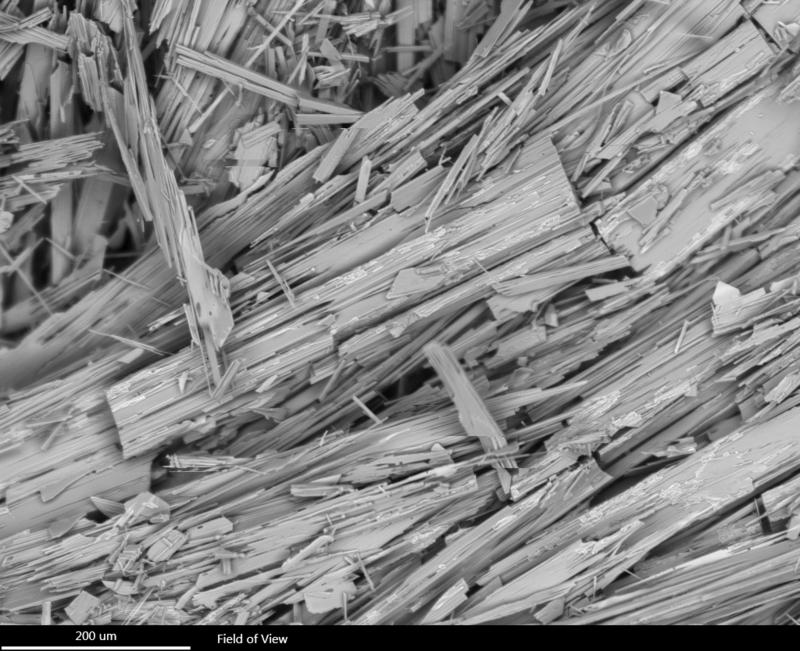 I opened the fluid pouch and dropped a small drop on the cardboard, almost immediately the crystals started growing and I quickly popped it into the SEM vacuum. This was amazing! 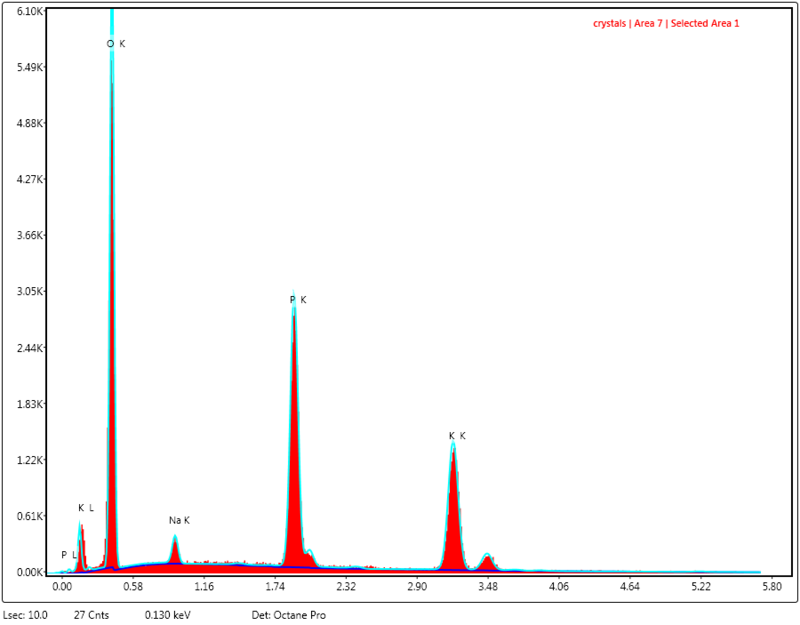 I confirmed that this with a spectrum showing K and P peaks! 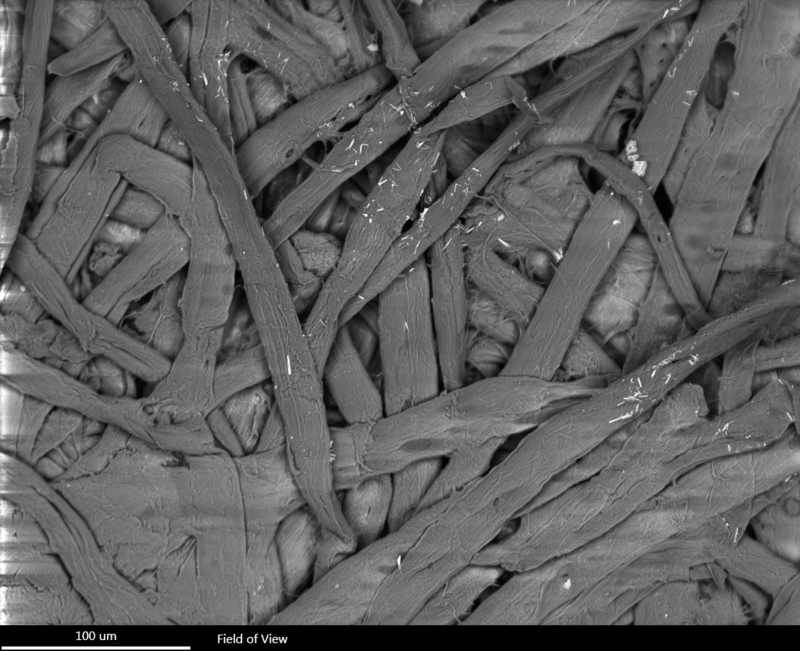 Since crystals don’t grow in an SEM (even at the highest pressure I had), I vented and let it grow, but the vac must have “stunted” the tree growth. 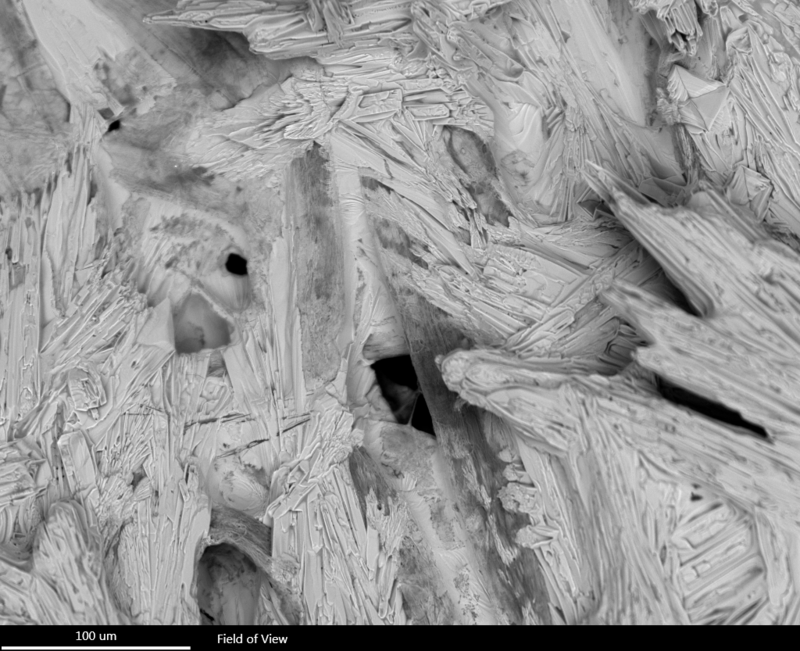 So I put more fluid on, grew it for an hour and got my best crystal images yet, like seeing snow inside an SEM. 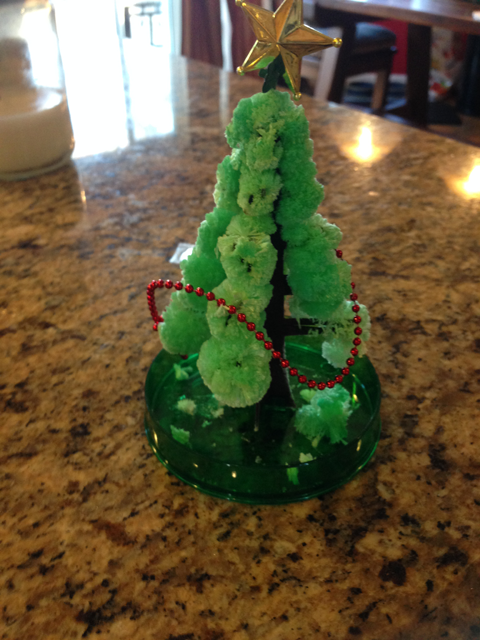 I hope you enjoyed sharing in my holiday chemistry science experiment experience. As you will see, chemistry and candy are real important in my life, which sets us up nicely for a future blog post on a tooth with a cavity that I found fascinating! Nice blog Tara. It’s fun getting kids excited about science and discovering the science in our daily lives. Looking forward to your webinar tomrrow.